KeyFibre cable, connector, and splice technology is designed to make FTTH deployment both easy and cost effective. Our comprehensive KeyFibre product range includes the 2F C552 flat drop cable, mechanical splice, universal assembly connector and a complete fibre installation tool kit. Together, the KeyFibre range provides one of the easiest ways to make fibre field terminations, resulting in quicker, and easier fibre installation with no need for additional tooling. An ideal solution for last mile drops in today’s FTTH network installations. Can be used both internally and externally. Flat 2F singlemode G 657 A2 cable. Includes 2 aramind reinforced plastic strength members, steel messenger wire, and an LSZH sheath. Please fill in the form below to request a datasheet for the KeyFibre C552 Flat Drop Cable. KeyFibre C552 flat drop cable is available from stock. For use in FTTX systems, LAN, WAN, CATV, Transport, Central Office, Data Centres, Networking Monitoring and Telecommunication. KeyFibre® Key Tool Kit, contains the essential installation tools needed for fast field termination of single fibres, without the need of specific tools. KeyQuick complete range is designed for use by everyone. The process of performing fibre optic connections is so easy, we guarantee that technicians without previous fibre skills can carry out terminations with ease. The kit includes our own Universal Fiber Cleaver, a high precision tool to guarantee performance of connections. High Precision manual installation tools for fibre preparation, and KeyFibre® Visual Fault Locator (VFL) with SC UPC Patch cable and sleeve. It is cost effective and convenient, with everything contained within a strong metal carry case. Please fill in the form below to request a KeyFibre Toolkit datasheet. For use in FTTX systems, LAN, WAN, CATV, transport, central office, data centres, networking, monitoring and telecommunication. 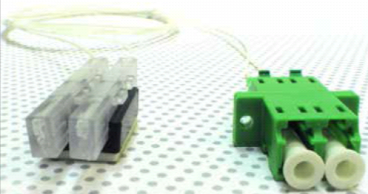 The KeyQuick® Mechanical Splice was designed for splicing any 250µm to 900µm fibres. No additional tooling is required for 900/900µm or 900/250µm splice. Using V-groove technology, it requires no epoxy. With transparent body design the splice result can be seen using the Visual Fault Locator immediately. It has a mean insertion loss of 0.1dB and an installation time of less than 30 seconds. This is an ideal solution for outside plant or in building terminations. Please fill in the form below to request a Mechanical Splice datasheet. KeyFibre Mechanical Splice is available from stock. For use is FTTX systems, LAN, WAN and Metro networks, data centres, networking, monitoring and telecommunication. The KeyQuick®10 SC Universal Field Installable Connector is an easy-to-install device, designed for fast, simple and reliable terminations of single fibres. No tool or jig is required. Skill-free design, and reusable technology. Universal design for singlemode and multimode fibres with 250µm, 900µm, 2.0mm, 3.0mm and FTTH flat optical cable. It is designed for fast termination with pre-polished connector. Using V groove technology, it requires no epoxy. This is an ideal solution, either for outside plant or in building. Universal for 250µm, 900µm, 2.0mm, 3.0mm and flat cable. These are regularly sold part numbers that are available from stock but other versions and options are available upon request. All parts come with Black boot, 25 pieces per carton, weighing 0.20kg each and measuring 17.5 (L) x 12.5 (D) x 4.5 (H)cm. KeyFibre KeyQuick Pigtails offer installers and providers a quick and easy method to make a fibre connections. No requirement of fusion splice machine. Only standard tools are required. Skill-free design. It provides an excellent reflection performance while reducing installation time, five times less than making a traditional splice. Labour costs in the field are highly reduced. KeyFibre KeyQuick Pigtails can be terminated with any kind of connector: SC, LC, ST, FC, E2000, UPC or APC polish with SM 9/125 G657A tight buffer 900 microns cable, or MM 62,5/125, OM3 (10GbE/300m), and OM4 (10GbE/550m). Standard length is 0.75 meters. KeyFibre KeyQuick pigtails are available from stock. KeyFibre products are available from stock for collection or delivery. All orders placed before 5pm can be delivered next day subject to confirmation at time of order. Please contact us for more information.